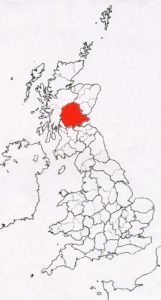 Stirling and the Kingdom of Fife. 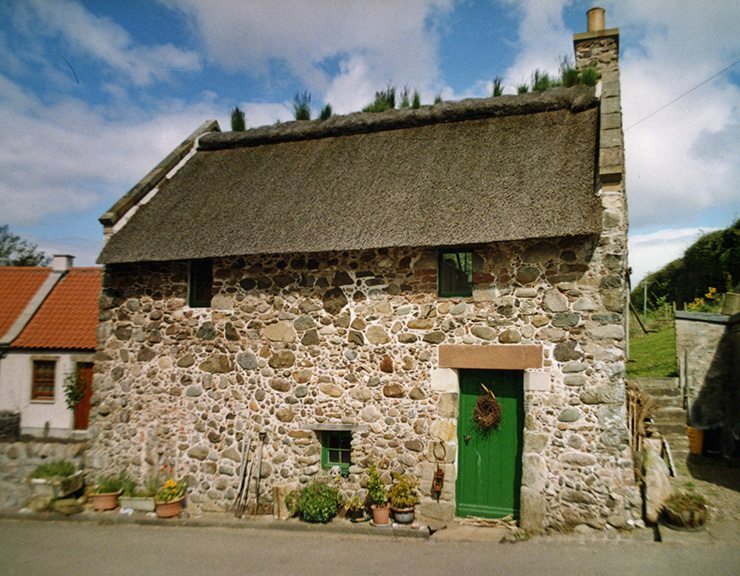 As seen in previous pages, the movement in eighteenth century Scotland, to improve all aspects of life; included changing the traditions of thatching. Here it also went one stage further and provided a new abundant material; that still dominates the local craft today. The local thatchers adapted this new material, to suit the local styles. Often the reed was cut in half. 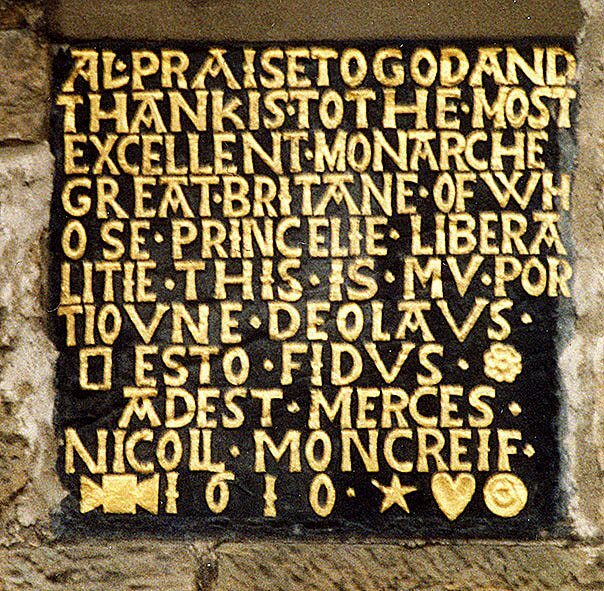 In the 1970’s this was noted on a roof, at Auchtermuchty in Fife. Here, cut reeds had been driven into the original, turf based, oat straw roof. This seems to be a logical extension, of the stobbing method. A ridge of turf, on a clay base, completed the roof. 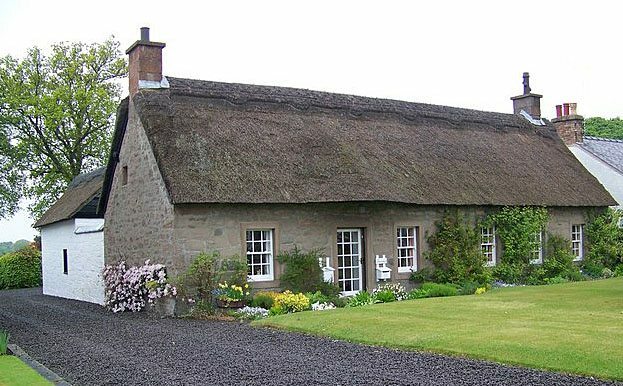 The turf and cereal straw of the roof in Fife, were the original materials in this area; both of these and the use of rushes, was also noted in Kinross and Clackmannan in 1814. 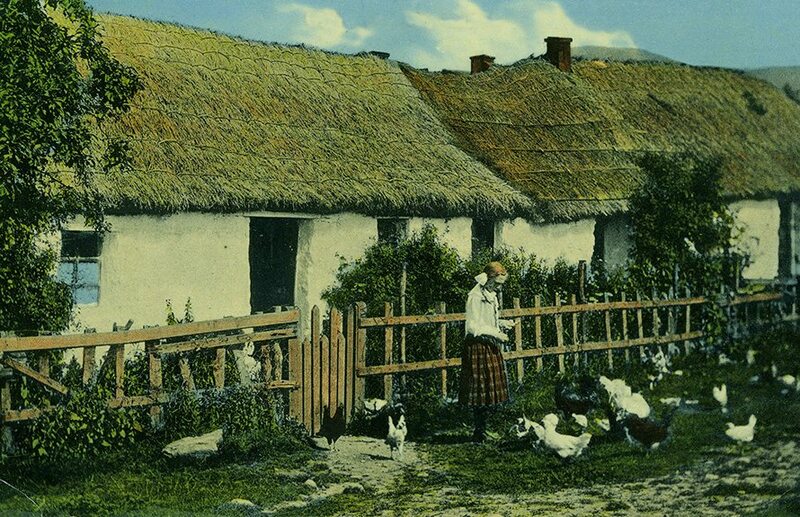 These more Highland methods also held sway in western Perthshire; long after this date. Here a crook and caber fixing, along with some spars and liggers, was quite common. Using mainly straw, but also heather and ferns. Changing over… At Muirton of Ardblair. 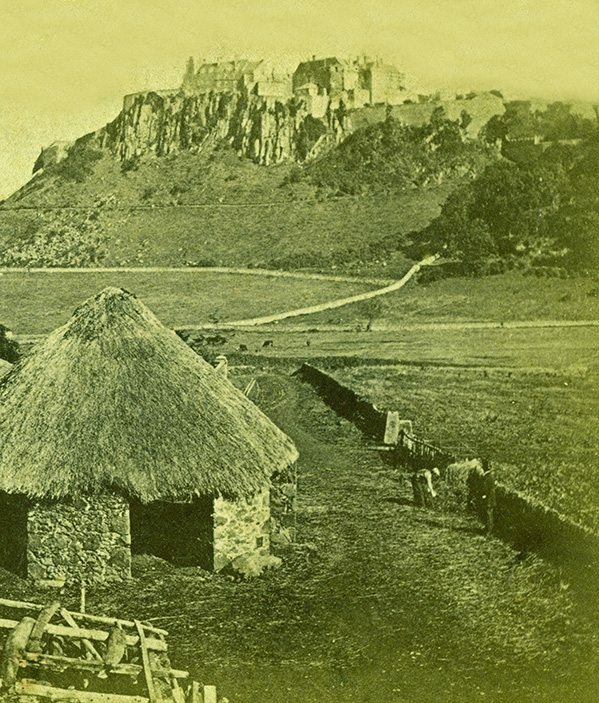 The upper photo shows a cottage, twenty miles or so north of the Tay, finally succumbing to water reed. The right hand end being recently completed and topped with turf. 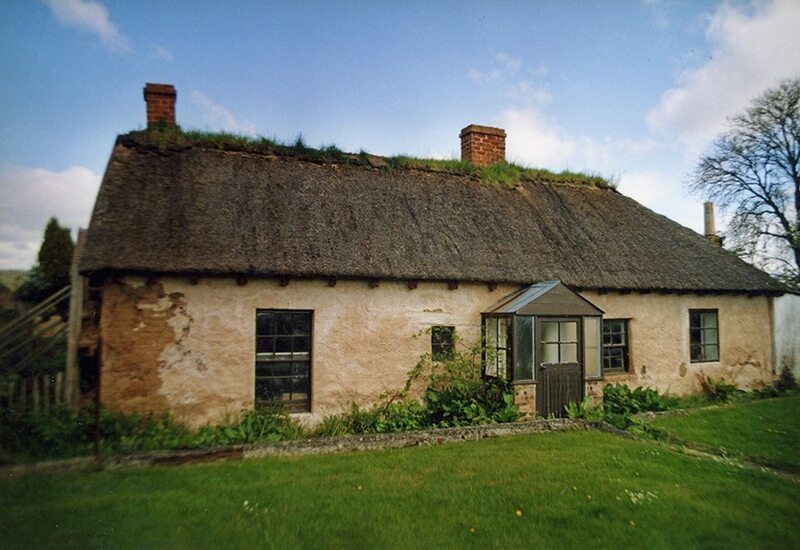 However the thatching methods have not been perfected. As some of the top courses have blown or slipped off! It now needs the help of a leaning caber to hold things on, at the boarded gable end. 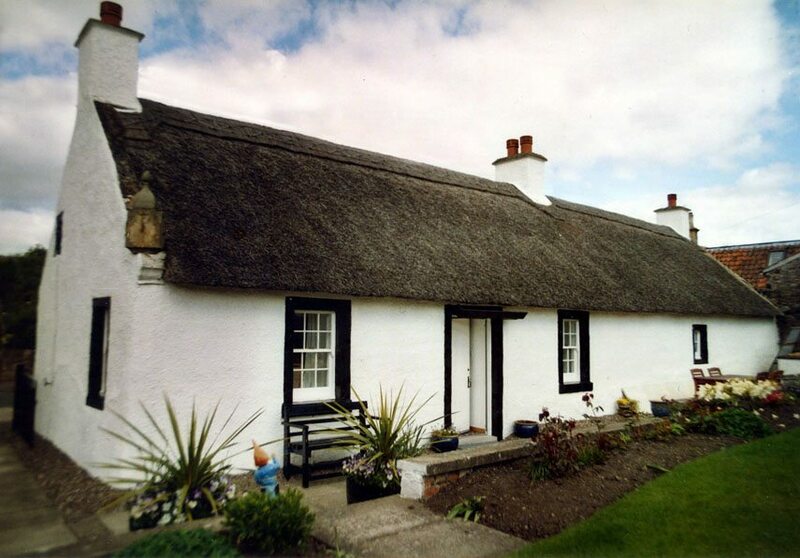 The left side of the cottage still has it’s straw thatch, done in a Northern style. 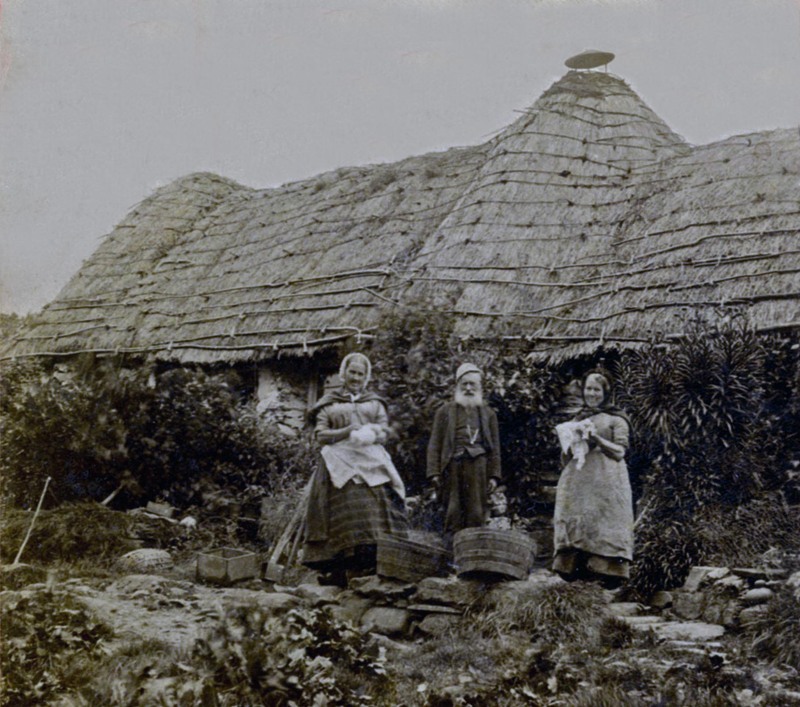 The Highland tradition having already disappeared from this locality, as well as further south. 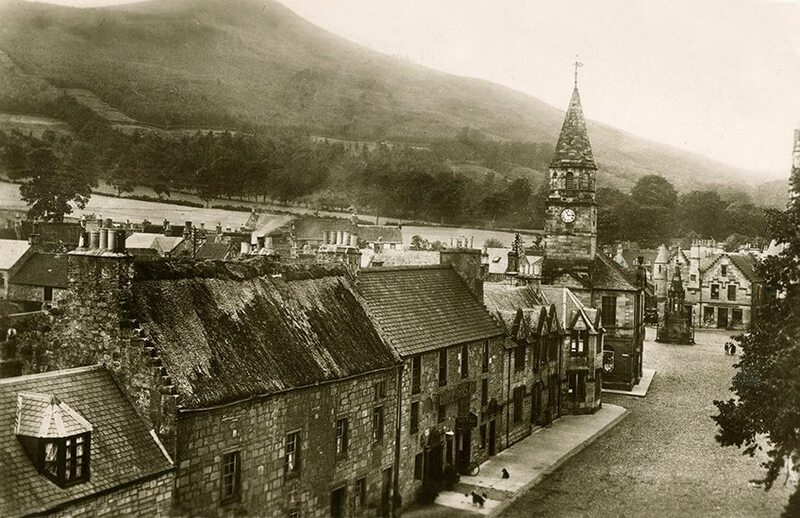 The lower image shows the scene a little later, in around 1910. 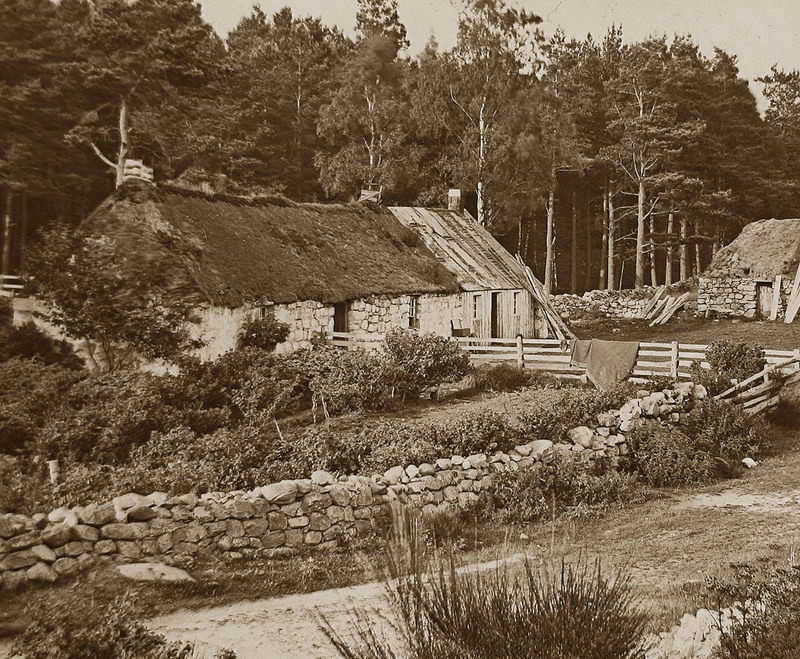 Now the cottage has wooden gable ends, with turf on both ridge and gables. The left hand part of the property has decayed beyond redemption! 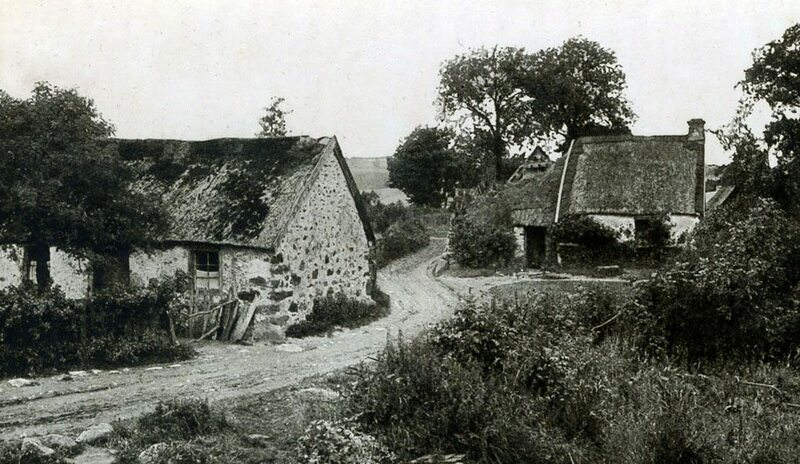 More Tay thatch is shown covering the building on the left. 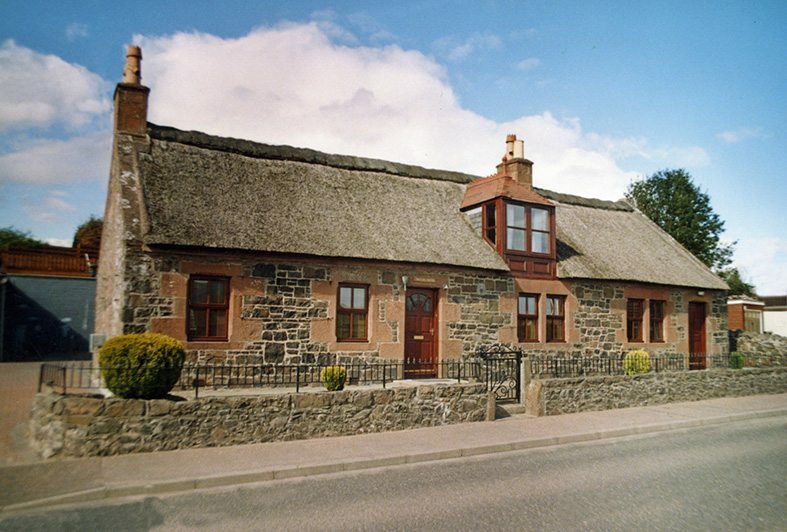 Tay reeds and turf… At Collessie, a Fife village with more than a few attractive thatches. 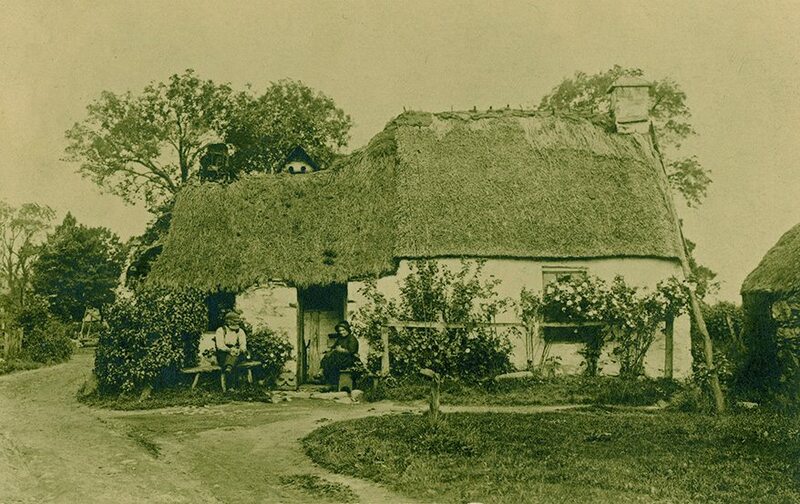 The lower cottage having a straw ridge. 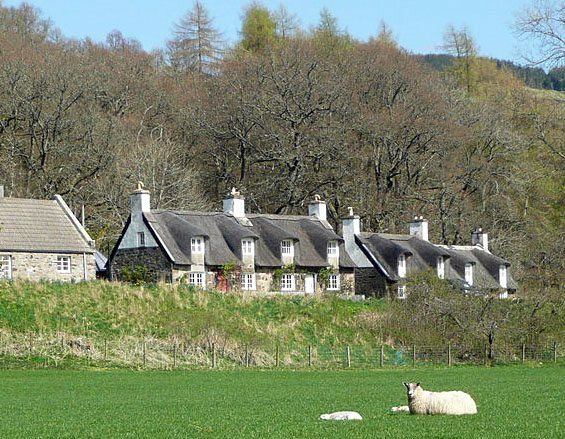 More Tay reeds… The original Tay reeds, for the cottages, in the upper pictures, at Fortingall, were hauled fifty miles up the Tay valley; over a century ago. 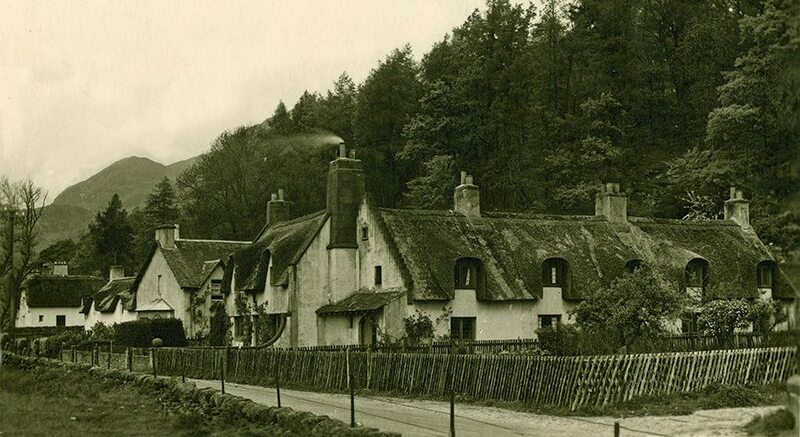 Fortingall was built in 1890-91 by shipowner and MP, Sir Donald Currie, who bought the village in 1885.The thatched cottages are good examples of the ‘arts and crafts’ style. But hardly traditional for central Perthshire… Phots;copyright & thanks, Russell Wills & Ann Brennan. 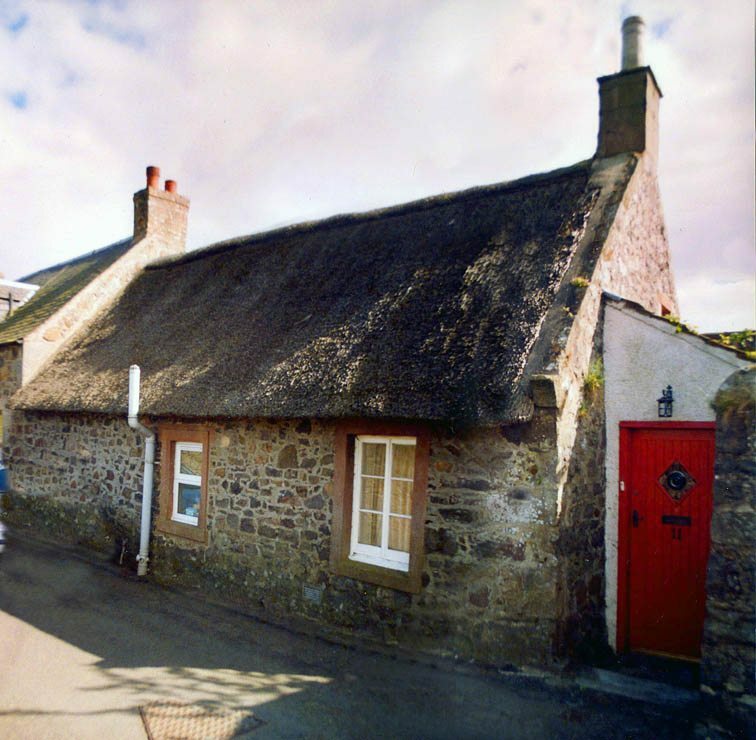 ** The distance from the reed beds, is only a tenth of that, for the two lower cottages, at Auchtermuchty in Fife. Their roofs being topped, with a turf ridge. 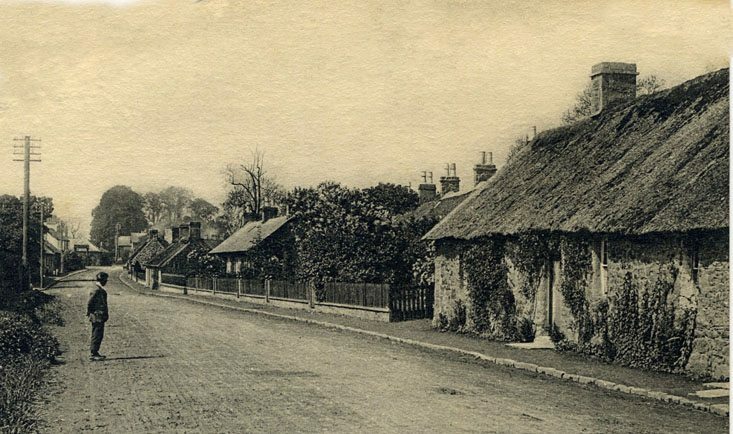 Falkland thatch… The tall thatched house on the left of this Edwardian photo, lies opposite the royal palace, in this Fife town. Still being covered with Tay reeds and topped with turf. 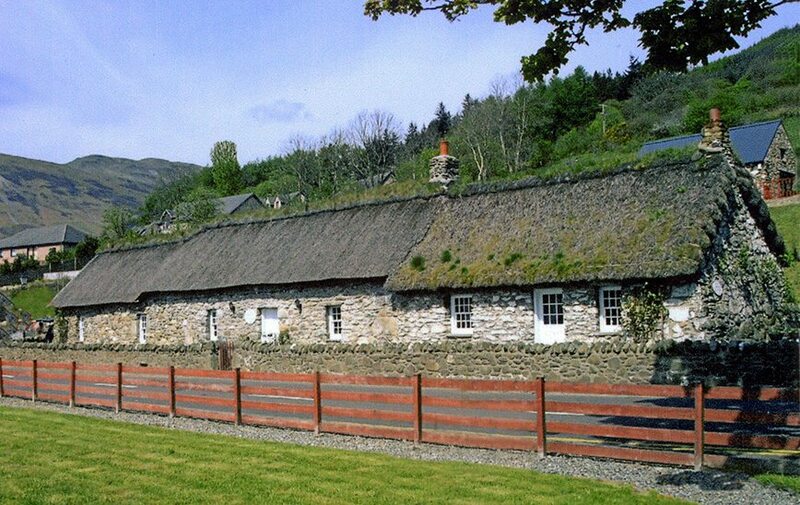 As it’s splendid datestone shows, four centuries have passed since it was first thatched. 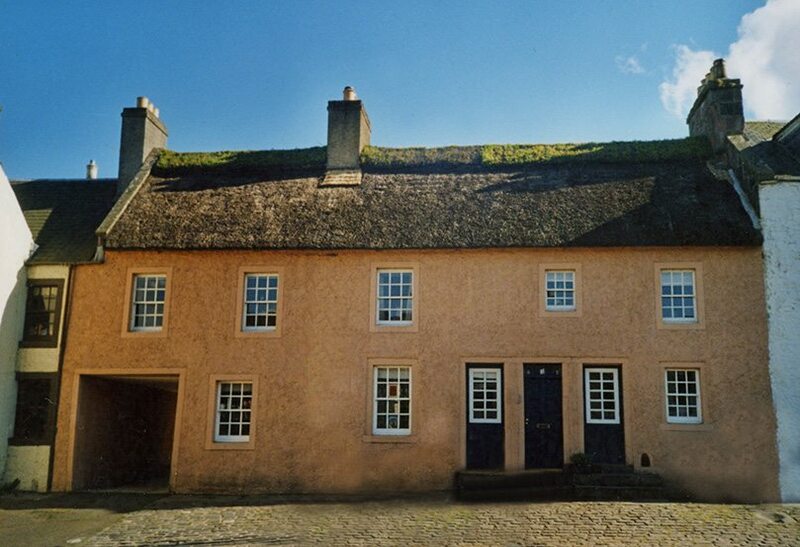 More tall thatch, topped with turf… Overlooking the Firth of Tay; at Newburgh in Fife. 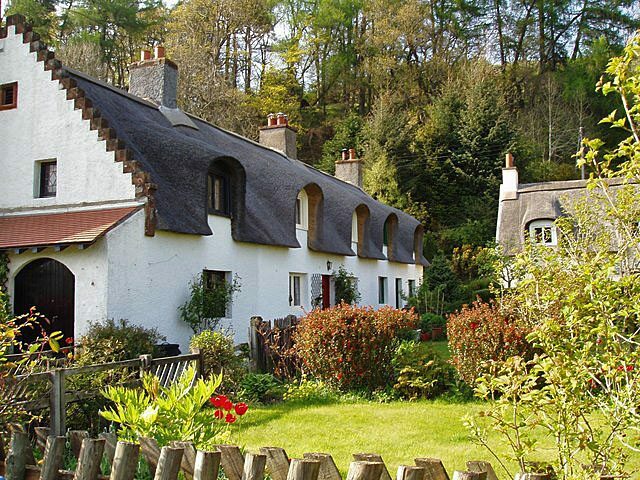 Four Perthshire thatches… The upper cottage lies in Stratmore at Kinrossie. Photo; copyright & thanks, ‘Maigheach-gheal’**. Left. The Old Schoolhouse, at Cottown, constructed between 1745 and 1770. A rare example of 18th century ‘muclwall’ (mudwall)construction; right on the banks of the Tay. Now redundant, but in the care of Scotland’s National Trust. 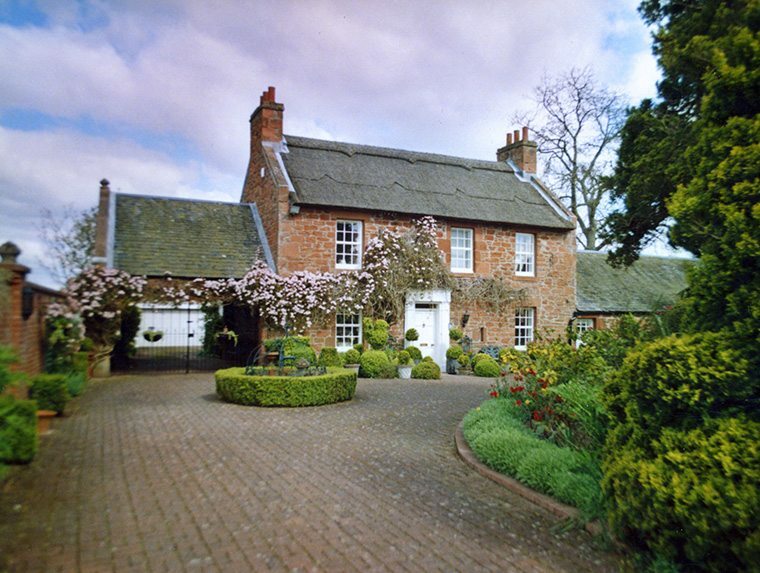 The house on the right, at Bridge of Earn, is also coated with Tay reed. But there is no turf ridge; only a clever design in the coatwork and an ornamental ridge of straw. 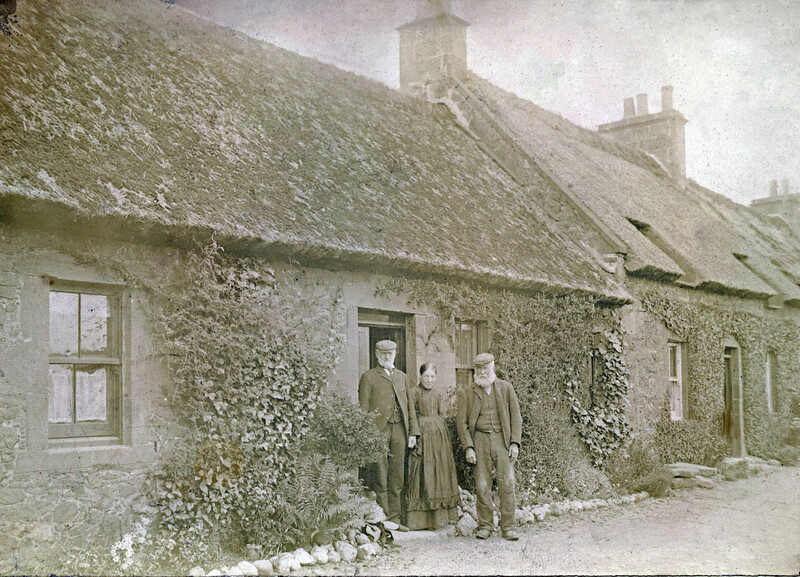 The lower image of around 1900, shows Tay reeds at Longforgan, in the Carse of Gowrie. 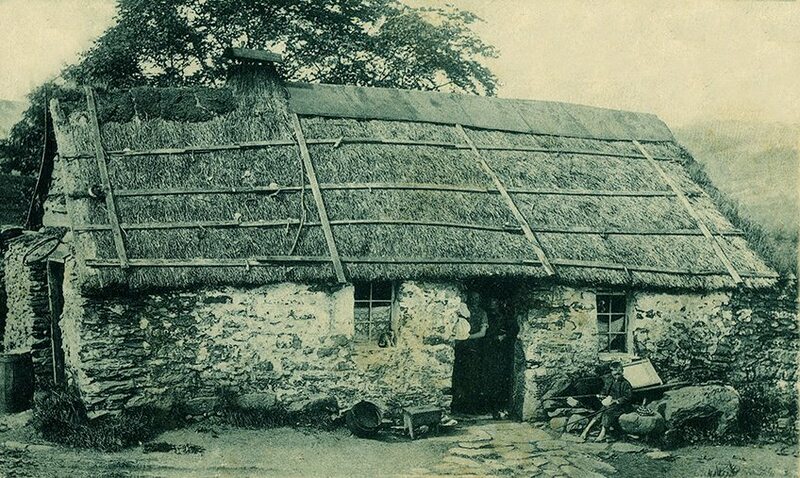 Caber framed thatch… At Duntaylor Aberfeldy, around 1900. In the Tay valley, but no water reeds here. The rigid caber frame, is keeping some straw thatch in place; with the odd large wooden crook, giving extra fixing. King’s Park, Stirling… Overlooked by the mighty castle. A careful look to the right of this image, will show a top hatted gent watching a thatcher, doing a little yealming. Unfortunately the photographer thought the castle a better view, than the thatcher working on the other side of this little building. But what they have shown is some untrimmed, new long straw thatching. Tay reeds and Turf… A slightly later image perhaps, of some neat Tay water reed roofs; no doubt in Fife. As dipicted by the ‘Photo Company’ of Edinburgh.